Over the years, the process of helping students learn their favourite guitar solos, as well as my own study and practice of instrumental solos of various nature, has allowed me to develop a systematic way to tackle this specific task. Learning to play a solo note by note is one of the most effective ways to develop our ears, rhythmic awareness, taste, technique, and musical vocabulary. First of all, I encourage students to identify the musical elements that made them choose a guitar solo. Was it the expressive playing, the string bending, the fast runs, the note choice, the rhythmic phrasing, or the use of vibrato that inspired them to choose that specific solo? Understanding what you like musically is a very important step towards the development of your own aesthetics and preferences for a variety of musical parameters. The first two tasks involve visual and aural learning strategies, which are going to build a solid foundation before the student actually starts practising the solo on the guitar. The other three points deal with sourcing out sheet music and available tablature in order to get the solo under the fingers and finally be able to play along with the original recording. Let’s discuss these individual points to discover what each component brings to the table. The first step towards familiarizing yourself with the solo you’d like to learn is to research how many versions may be available to you in the form of live performances, instructional videos, and workshops. In today’s world, we are blessed with having dozens (sometimes hundreds) of live performances of our favourite songs available on YouTube. 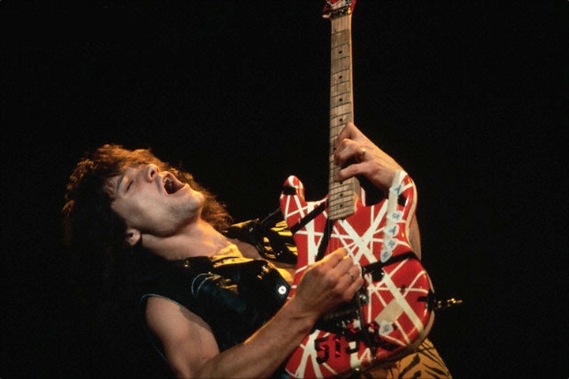 Watching several versions of the solo you have chosen to study gives you insights on the guitarist’s technique and stylistic choices. You may discover how a difficult passage is executed by simply observing the guitarist’s hands in action and captured in close caption. You may discover that they like bending strings with their third finger exclusively, sliding around the neck with their index finger, or leaning toward a legato-style technique that involves a sparse use of the pick. In addition, you can get a sense of where the musical vocabulary they are playing is located on the neck and how it unfolds over the two distinct dimensions of the fretboard, vertical and horizontal. This preliminary analysis will inform your future practice sessions by providing you with a strong visual reference that reinforces the relationship between the musical language and the geography of the guitar. Finally, it is advisable to find out if the solo you are interested in has been included in instructional videos released and performed by the artists themselves. These types of video lessons are the best way to observe the solo under different camera angles and with close-up viewing. Alternatively, the solo may have been played during a workshop where the artists are explaining and demonstrating the use of specific techniques and devices in their playing. These types of scenarios are quite common these days, so it is worth researching to discover what is already available to you. The next step in the learning process is to slow down the recordings and the videos you have sourced out. It is very difficult to keep track of all the musical nuances contained in a solo in real time. By slowing things down, you allow yourself to hear all the technical, melodic, and rhythmic subtleties within a solo. Improving your awareness of these musical elements has a tremendous impact on the quality and progress rate of your learning curve. For example, it is quite common for students to only focus on playing the ‘right notes’ of a solo but not to pay attention to how these notes are performed. What kind of vibrato are the players using? Are the notes articulated with pick strokes, accents, pull-offs, hammer-ons, slides, and so forth? What about the rhythmic and tonal variety in their bending technique? How are they using dynamics to shape their solo? A similar discussion can be applied to slowing down videos. In slow motion, it is quite easy to follow the exact movements of a guitarist’s hands and fingers. We can detect how a musical phrase is played and which fingers are involved in its execution. The combination of audio and video together has a tremendous positive impact on your awareness of music: seeing and hearing will facilitate your learning process and strengthen your ability to internalize musical vocabulary at a quicker pace. Slowing audio and video down allows you to put many important aspects of guitar techniques under the microscope. YouTube has an in-built speed control setting that decreases the speed by 25 or 50 per cent, which is a great starting point. If you’d like to have more control on the speed rate of a song, I would suggest to download a free software called Audacity. Beside modification in the tempo of a song, this program allows you to highlight specific parts of a solo and loop them or to modify the EQ of the recording to enhance the frequency of the guitar’s sound. These are all great tools we can use to practise more effectively and to perfect all the nuances of a musical phrase. After building a strong aural and visual foundation through attentive watching and listening, it is time to consult any existing literature on the subject: this can take the form of sheet music, tablature, and online video lessons available on YouTube. Gathering this information is essential before you start practising your chosen solo. Most of the solos students are interested in learning have already been published in official transcription books authorized by the artists themselves. These books can be bought for reasonable prices and are also available as second hand items. Other dedicated musicians and educators may offer free transcriptions on their websites or video lessons. Alternatively, chances are that there are many free tablature versions of the chosen solos on the internet. If you are using free tabs as your primary source of learning, I would advise not to take the information as being completely accurate. Always double check that what is written on the page sounds like the actual music. Watch videos attentively to examine if the tablature has depicted what you see accurately. You may notice a discrepancy between the notes on the page and the way the guitarist performs the solo when you watch him or her in action. It is common to find mistakes in authorized publications approved by artists and bands as well, so learn to be critical and use your ears to put everything under scrutiny. The most common mistake we all do when learning something new is that we try to assimilate too much information all at once. Being able to play a solo involves memorizing a lot of data, so it is best to tackle small portions of it at a time. Moreover, it is important to start practising its parts at a much slower pace than the original tempo. When working on new musical information, we need more time to process the tasks we are trying to internalize and to execute them with accuracy and while being relaxed. Don’t be in a hurry, it is better to play something precisely at a slow tempo than to sound messy at a faster speed. Solos resemble a speech or a short story: they are a collection of individual phrases of various length intermitted by space. Each phrase has its own unique character in terms of inflection, rhythm, and dynamics. Using the natural structure of a solo is a great way to break it down into separate sections in order to focus on assimilating smaller portions of information one at a time. Within a specific section or phrase of a solo, it is common to find challenging material that requires even more attentive and focused practice. We may stumble on a complex rhythmic pattern, difficult scalar sequence, or a fast passage that are beyond our current technical abilities. In these cases, it is best to isolate the problem as much as possible and develop exercises to build effective ways to overcome that obstacle. For example, if you encounter a scalar passage that is particularly challenging, try to move that specific pattern in other positions of the fretboard and on different sets of strings. This method will allow you to internalize the pattern on a deeper level and to play it in its original format with a much better understanding of its inner logic and with more confidence. The accumulation of the previous four steps should lead to the point where you have memorized the entire solo and are ready to play along with the recording. Try to use the same approach: start slowly and focus on being accurate. Playing a whole solo is quite different from playing its individual parts perfectly: it requires a great deal of concentration and endurance. Commit not to approximate and be honest with yourself. If you always mess up when you get to a certain point of the solo, maybe it is time to revisit that section. Have you really mastered each phrase or are you too eager to cross the finish line? Go back and listen to the slowed down solo once again, you may now be able to hear subtleties you were not aware of when you started your learning journey. Our ears get more and more refined over time, so it is important to revisit the music on a regular basis. From time to time, try to push yourself and play the solo at a tempo that is beyond your comfort zone. See how long you can keep up for and try to get back into the solo if you mess something up. Over time, this will teach you how to react quickly when something unexpected happens during your solo performance. Professional players make mistakes all the time, they are just very quick at reacting at their mistakes and get back into the music before everyone else takes notice of what happened. Finally, try to play the solo as if you wrote it and were the guitarist playing it on stage or in the recording room. Try to replicate every element that particular guitarist delivered on that solo: tone, rhythmic feel, dynamics, vibrato, phrasing, and so on. All the greats have also started their musical development by imitating their heroes. Striving to sound just like the guitarists you admire can really help you shape your own unique voice on the guitar.